It is 2001 in New York City, in the lull between the collapse of the dot-com boom and the terrible events of September 11th. Silicon Alley is a ghost town, Web 1.0 is having adolescent angst, Google has yet to IPO, Microsoft is still considered the Evil Empire. There may not be quite as much money around as there was at the height of the tech bubble, but there’s no shortage of swindlers looking to grab a piece of what’s left. Maxine Tarnow is running a nice little fraud investigation business on the Upper West Side, chasing down different kinds of small-scale con artists. She used to be legally certified but her license got pulled a while back, which has actually turned out to be a blessing because now she can follow her own code of ethics—carry a Beretta, do business with sleazebags, hack into people’s bank accounts—without having too much guilt about any of it. Otherwise, just your average working mom—two boys in elementary school, an off-and-on situation with her sort of semi-ex-husband Horst, life as normal as it ever gets in the neighborhood—till Maxine starts looking into the finances of a computer-security firm and its billionaire geek CEO, whereupon things begin rapidly to jam onto the subway and head downtown. She soon finds herself mixed up with a drug runner in an art deco motorboat, a professional nose obsessed with Hitler’s aftershave, a neoliberal enforcer with footwear issues, plus elements of the Russian mob and various bloggers, hackers, code monkeys, and entrepreneurs, some of whom begin to show up mysteriously dead. Foul play, of course. With occasional excursions into the DeepWeb and out to Long Island, Thomas Pynchon, channeling his inner Jewish mother, brings us a historical romance of New York in the early days of the internet, not that distant in calendar time but galactically remote from where we’ve journeyed to since. "If not here at the end of history, when? If not Pynchon, who? 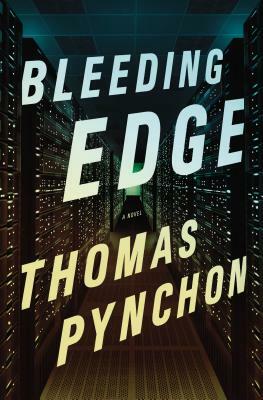 Reading Bleeding Edge, tearing up at the beauty of its sadness or the punches of its hilarity, you may realize it as the 9/11 novel you never knew you needed… a necessary novel and one that literary history has been waiting for." “The book’s real accomplishment is to claim the last decade as Pynchon territory, a continuation of the same tensions — between freedom and captivity, momentum and entropy, meaning and chaos — through which he has framed the last half-century." Thomas Pynchon is the author of V., The Crying of Lot 49, Gravity’s Rainbow, Slow Learner, a collection of short stories, Vineland, Mason & Dixon, Against the Day, Inherent Vice, and Bleeding Edge. He received the National Book Award for Gravity’s Rainbow in 1974.